This is a version of the Better Volume Indicator from Barry Taylor’s Emini Watch. It studies the relationship between the spread (range) and volume, i.e. Volume Spread Analysis (VSA). Our version also comes with the option of activating the Relative Volume calculation. Breakout or climax bars: A breakout or climax bar is a wide range high volume bar for which the the product “volume times range” is higher than for all preceding bars of the lookback period. Churn bars: A churn bar is a narrow range high volume bar for which the ratio “volume per range” is higher than for all preceding bars of the lookback period. Climax churn bars: A climax churn bar is a high volume bar that qualifies both as a climax bar and as a churn bar. Low volume bars: A low volume bar is a bar which has a lower volume than for all preceding bars of the lookback period. The Better Volume indicator uses two lookback periods. The larger lookback period identifies stronger climax and churn bars, the smaller lookback period points to weaker climax and churn bars and is used to identify low volume bars. A breakout or climax bar may occur at different locations. It may start a trend as a breakout bar, it may indicate that an existing trend continues after price has consolidated or it may occur at the end of a trend and indicate that the trend is near exhaustion. This bar type is similar to classical types of gaps that may be found on daily charts. There are runaway gaps, continuation gaps and exhaustion gaps. Breakout or climax bars may be used as a subsitute for those gaps when trading smaller timeframes. When you use the BetterVolume indicator with intraday data, it is pretty much distorted at the beginning of the regular session. When compared to pre-session bars, all the bars in the beginning of the regular session look like high volume bars, which in turn leads to false signals. This behavior is corrected when the indicator is applied to “relative volume” instead of “absolute volume”. This version of the indicator allows for Volume Spread analysis on both absolute volume and relative volume. Sound Alerts: The indicator comes with sound alerts. Based on these values you may define cell conditions and show the signals as text with background color on the market analyzer. 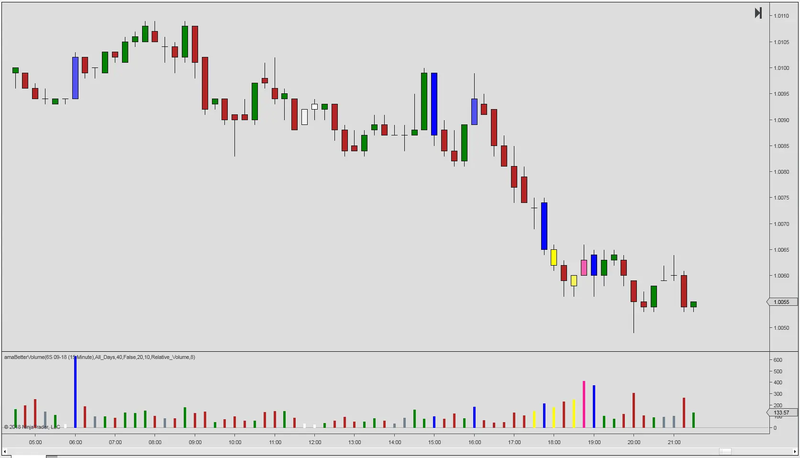 The Better Volume indicator is available for NinjaTrader 8.